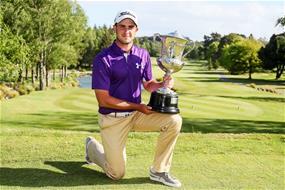 Waikato’s Charlie Smail has won the 2018 New Zealand Amateur Championship to claim the biggest win of his young career by defeating Wellington’s Kerry Mountcastle 5&4 in the 36-hole final. The 20-year-old has now achieved something his famous golfing father, David Smail was never able to, which was an extremely proud moment for the family at Wairakei Golf & Sanctuary this afternoon. “It’s amazing and a very special feeling, I can’t really believe it at the moment, this is the biggest win of my career by far,” said Smail. 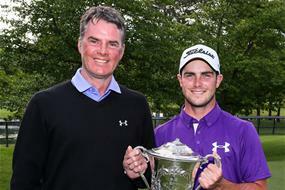 While his father David Smail is one of New Zealand’s most decorated and successful professionals, he was never able to accomplish his son’s feat of winning the national amateur title. “It feels pretty amazing and he has done a lot more than I did in the amateur stuff, I think I hardly ever made the top 32, so he’s done well and done us proud,” said an emotional David Smail. It was a family affair with his mother Sheree on the bag this week who also had a very successful amateur career and this is clearly a big stepping stone for a player who has big shoes to fill. “We are all immensely proud of what he has done today and I hope he eclipses us and makes us look silly. Although Mountcastle fell just short today, he has had a year to remember after winning on the Jennian Homes Charles Tour against the professionals before claiming the New Zealand Stroke Play Championship in Wellington. He now rushes home to pack his bags before heading off to Australia at 6:00am to play in the NSW Open alongside Daniel Hillier who will also feature in the Australian Open alongside some of the world’s best.